We’ll be heading up to the glorious northern paradise of Manchester to do a workshop (and a concert) at the Sines and Squares Festival: come join us! This workshop will serve as both an introduction to musical programming and music making with modular synthesisers, and as a showcase of some of the emerging, hybrid ways of working with computers and Eurorack modular synthesisers. We begin by building a simple synthesis patch in C++. Focusing on fun, goal-oriented tasks is a great way to learn the basics of this powerful programming language. We will then show how easily the patch can be compiled and uploaded to the OWL Modular synthesizer. Through some hands on patching and sequencing, you will see (and hear!) how the synthesis patch just created on a computer can be controlled, played and performed in new and exciting ways when it becomes part of a modular system. In the final part of the workshop, we will show ways in which the modular system can be sequenced and played from the computer, integrating it with a DAW. 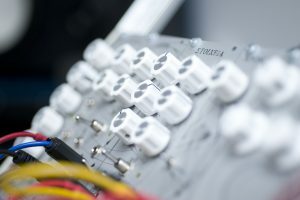 This is a unique opportunity to learn about musical programming, modular synthesis and hybrid workflows whilst using state-of-the-art technologies. Participants do not need to bring anything but themselves: we will bring Rebel Technology modular systems for all participants to get hands-on with and computer workstations will be available. No prior programming experience is required. Numbers are however limited and pre-booking is essential. Read more about Sines and Squares 2016.